The Skoda Octavia facelift went on sale in Europe earlier this year, but the new split-headlamp face has taken a meaner expression with the world reveal of the Octavia RS 245 at the 2017 Geneva Motor Show. The RS 245 packs the same 2-litre engine as the Octavia RS 230, but it squeezes out 15PS more than the standard RS. Similarly, torque goes up from 350 to 370Nm, produced between 1,600 and 4,300rpm. The 0-100kmph time has reduced by a tenth of a second to 6.6s and top speed is limited to 250kmph. Skoda will offer the Octavia RS 250 internationally with the choice of a 6-speed manual or a 7-speed dual-clutch automatic. Two body styles are available as well, the standard notchback we know well and an estate-style Combi. Visual changes include a new fascia with a wider grille and wide honeycomb air intakes in the bumper. The redesigned split headlamps from the facelift model continue and they offer full LED lighting as standard. The wing mirrors and tail pipes on the Octavia RS 245 get a black treatment. Skoda claims that the sport exhaust system sounds different to other cars in the range. The changes aren't just visual; the RS 245 sits 15mm lower than the standard Octavias and the rear track is 30mm wider than its predecessor, the Octavia RS 230. 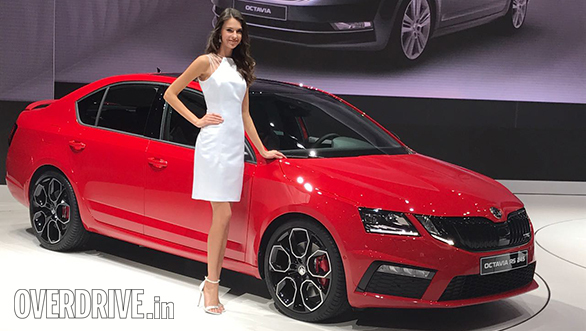 Skoda is expected to bring down the Octavia RS to India this year, but it is currently unclear if India will get the RS 245.